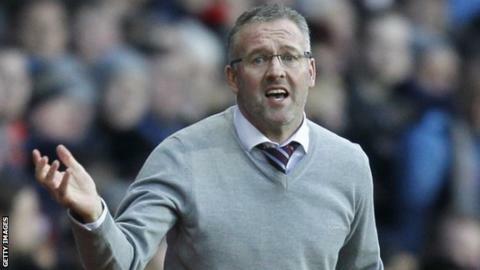 Former Aston Villa manager Paul Lambert has been appointed Blackburn Rovers boss, replacing the sacked Gary Bowyer. Lambert, 46, is Blackburn's seventh permanent manager in seven years. Bowyer was sacked on 10 November after two wins in 10 league games left Rovers 16th in the Championship table. Lambert, who was sacked by Villa in February, said: "After a short period out of the game, I feel refreshed and I am really looking forward to the challenge ahead." Former Rovers player and youth team coach Alan Irvine rejoins the club as assistant and former head of youth coaching Rob Kelly also returns to Ewood Park. Lambert's first game in charge is the Lancashire derby at Preston North End on 21 November. It is Lambert's first job since being sacked by Villa in February after the club dropped into the Premier League relegation zone following a 2-0 away defeat at Hull City. The Scot arrived at Villa in June 2012 with a strong reputation, having managed Livingston, Wycombe, Colchester and Norwich. He had taken the Canaries from League One to the Premier League, but he struggled to make an impact at Villa, finishing 15th in his first two full seasons. "Blackburn Rovers is a club with superb support and fine traditions, being a founding member of both the Football League and the Premier League," added Lambert. "I bring with me a very trusted backroom team that I believe is equipped to help me create an exciting era for the club and I hope to deliver a brand of football that will both entertain the supporters and bring success." Loan signings and free transfers cannot earn more than around £10,000 per week. Last month, managing director Derek Shaw said the club are one big sale away from getting out of their Financial Fair Play embargo. The Championship club have been unable to buy players since December 2014 for not meeting the Football League's Fair Play Requirement. Rovers are owned by Indian poultry firm Venky's, owned by the Rao family, who purchased the club for £43m in 2010. The club's net debt rose to £79.8m in January with Rovers in their fourth season in the second tier following their relegation from the Premier League in 2011-12.